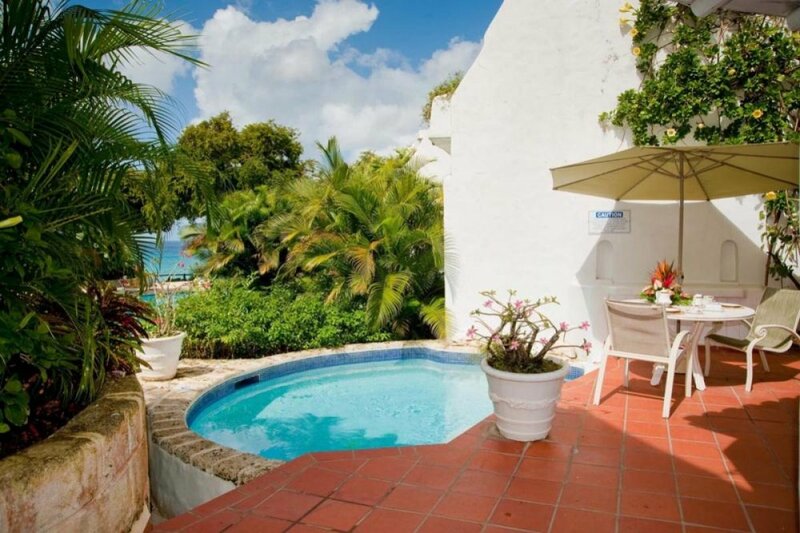 Surrounded by lush tropical landscaping, Ocean View offers guests their own plunge pool as well as use of the large central swimming pool and surrounding deck at Merlin Bay. This two story home has an indoor dining room, a sunken sitting area that opens to the plunge pool and pool terrace. Steps from the central coral stone deck lead down to a secluded white beach and the sparkling waters of the Caribbean Sea. Rates include an efficient and friendly staff. Located in the St. James Parish of Barbados, Ocean View is one of eight villas in Merlin Bay. The three air-conditioned bedrooms all have their own terraces or balconies with impressive views of the swimming pool or ocean. The ground floor bedroom opens up to a private plunge pool terrace. All villas on the property encircle a central swimming pool and spacious sun deck. The sun deck is perched on a low sea cliff with steps that take you down to a secluded beach. Ocean View is located a short drive from Royal Westmoreland and Sandy Lane Hotel where Five-Star golf, tennis, and spa facilities are available. The property was as beautiful and relaxing as promoted. We loved having direct beach access, and the surrounding environment. There was an issue with one of the bathrooms which was resolved promptly. Excellent experience working with WhereToStay.com. Shawna was able to help us re-book when a last-minute family emergency occurred and we could not make our initial trip.